The hardware store was founded in 1941 by my grandfather Harry Billings. His sons Harry Billings, Fred Billings, and Jim Billings worked the store for many years. My father, Jim Billings took over management of the store in the 1960's. In the early 1970's I took over the store when my father passed away. 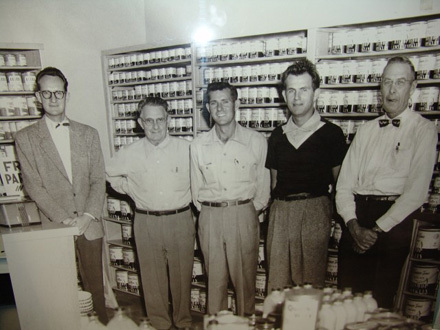 Here's a picture in the paint department from the 1950's. Pictured left to right are Guy Billings, Harry Billings, Fred Billings, Jim Billings, and an unknown cousin Billings. Click on the picture for an enlarged view. As you can see, my family has "paint" in our blood!